When we enter “Age of Faith,” Del is twelve years old, and the world around her is expanding ever faster, even though, in some ways, it still feels small and manageable — safe. Though “not ignorant of the facts of geography” she considered the faraway hills “to be the end of the world.” Her world was tight, knowable, and there was security in this thought. Much more likely, I saw, that their methods were haphazard and their knowledge hazy, their covetousness unfocused, their relationship to us next thing to accidental. I could go more easily up the river to the swamp when my belief in them faded, but I missed them, I missed the thought of them, for quite a while. With a title like “Age of Faith” and that introduction, we feel we know just where this story is going: Del’s similar dawning awareness that the world is a big place, that her personal relationship with God might just not exist. In some ways, the story does go there, but it’s much more interested in Del’s strong desire for such a controlled world — God just seems a good way to get it. Right after she says she misses the burglars, she says she never had such feelings about God. Her own family was not religious and did not attend church often. If they did, it was clear to Del — and to everyone else — that Del’s mother did not believe a word being spoken and seemed to find the whole thing distasteful. Del’s mother will explicitly say this later on in the story. Not eve she was prepared to say Nothing, and see herself and every stick and stone and feather in the world floating loose on that howling hopeless dark. No. And so the bulk of the story explores Del’s struggle to find that comfort she once received from the burglars: something that “made each thing seem confirmed in its value and uniqueness.” At one moment, she seems to find just what she’s looking for. She hates sewing, hates getting scolded by her teacher for being unable to thread the sewing machine, so she prays she will never have to do it again. Her prayer is answered almost immediately, and in a most unexpected way. Her certainty that this was God diminishes rapidly, though. This is a fascinating story of a young girls struggle to come out whole on the other side of “the unavoidable collision coming, of religion and life.” As if often the case, Munro spends a lot of time taking us in and out of Del’s experiences generally before she focuses her sights on one poignant episode where that collision happens dramatically before our eyes. In “Age of Faith” Del is about twelve and becomes “prey to a positive longing” for God. Belief in the Jordan family is a complicated thing. Del and her brother were baptized in the United Church, but no one goes. Instead, Del has a very early memory of her mother’s iron-clad belief in burglars, one that Del adopted as well. Del also knows that her mother’s fierce belief in education is akin to religion. Nevertheless, about the time they move to town, Del begins to go to church with the boarder, who sings in the choir. If God could be discovered, or recalled, everything would be safe. Del is also an ordinary kid who has to go to school, a place where she is both safe and unsafe. At school, she is famous for her wicked memory, but school is where she is also a very public failure in sewing class, an agony for which she prays to God for release. She longs for this annunciation. It just so happens that shortly after this, the sewing teacher loses all patience with Del and orders her to sweep the room instead. The question is — was this going to happen anyway? Or did God answer the prayer? Del cannot be sure. The way Del has been running the machine with no thread in it makes us feel that the reprieve was going to happen anyway. Del is also an ordinary older sister, and she decides to instruct her brother Owen on the subject of religion, while admonishing him that he cannot tell Mother (because Mother is a free thinker who is “cured of religion”). She tells him about being released from sewing on account of her prayer. Del is disappointed that Owen appears to be impervious to the call of religion. On Good Friday, Del announces she is going to church, and her mother realizes that the church in question is not the United, because they don’t have Good Friday service. Del is going to the impoverished Anglican Church. Addie, Del’s mother, responds to Del’s Good Friday religiosity with a typical Addie remark: that Christian belief in a God who required Jesus to die on the cross is as barbaric as Aztec sacrifice. But to Addie’s credit, Addie lets Del go to the service. Del remembers the service: “I realized I did not care a great deal, myself, about Christ dying for our sins. I only wanted God.” Meaning, she only wanted safety. The service is further complicated by the fact that Del sees flaws in the minister’s sermon. Regardless of her search for the sublime, the good student senses illogic in the minister’s argument. Del’s search for God is at a stalemate. At this moment, Del develops into a different sense of religion. She realizes God will not intercede; she realizes God “was not interested in such objections; they were not his.” She realizes that God is not necessarily safety. The end of the story is a puzzling epiphany. Del is startled by the depth of Owen’s love, and she is startled by his fervent desire to pray for Major’s life. She has this thought that ends the story: “Do missionaries ever have these times, of astonishment and shame?” Del knows she has been playing at religion. Owen’s love for Major is so pure and his need to save him so great, his agony so real, that Del is astonished at the encounter. A paragraph which Del has italicized models Del’s thoughts, although whether these could be the thoughts of a twelve year old is not clear. They feel more like Del’s adult self interpreting something which would be far more inchoate in a pre-teen. Could there be God not contained in the churches’ net at all, not made manageable by any spells and crosses, God real, and really in the world, and alien and unacceptable as death? Could there be God amazing, indifferent, beyond faith? This is a paradoxical and difficult pair of sentences. But she makes it clear: the age of organized religion, for Del, is a pre-teen thing. Searching for God, if it is to be done at all, will be done in the world. And if God is found, or felt, it will feel alien. To a degree, this is where Munro is going anyway: to the place where comfortable beliefs are of no use, and where what might be bedrock must be tested for its capacity to produce amazement and alienation. Munro uses story-telling to test life for bedrock: she tends to push a story until it reveals itself both amazing and unacceptable. Addie, for instance, is both amazing and unacceptable. Munro’s honesty also tends to push stories for “astonishment and shame.” By shame, I think she means the sudden recognition of your own part in someone else’s peril. I think she means humility. 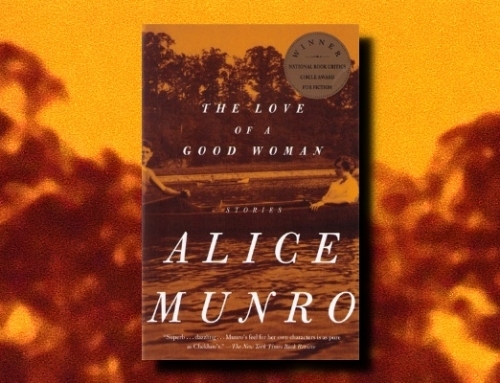 Love is a dangerously easy word, and Munro avoids it. And yet, this story demonstrates it, as do other stories, “Princess Ida,” for one (our thoughts here). This time, it is Addie letting Del try out religion, and it is Owen, in agony over the dog and the “flash of darkness,” that his execution will be. It is also Del, feeling the flash of astonishment at Owen’s despair. Circle back to the beginning — that Del’s first belief was in burglars. There is Del’s concern with safety and Munro’s insistence on the impossible: that we need safety, but it is never guaranteed. We watch Addie hide her key on the porch; we ourselves doubt this will keep out the burglars. Addie’s ritual in honor of safety foreshadows the ineffectuality that Del eventually feels in the rituals of church. Of course, what is most interesting is Munro’s account of Del’s moral development. She is astonished by Owen’s despair, and she is ashamed of what her play-acting has put him through. While the story is about a twelve year old, it is a grown woman, probably of about Munro’s own age, telling the story and awestruck, still, not by religion, but by Owen’s despair and her own shame. The search for the sublime ends with the adult Del saying what she should have said to Owen, “[W]e do not pray for things to happen or not to happen, but for the strength and grace to bear what does.” But how do you say that to a nine year old? The paradoxes of existence permeate Munro. The illogic of organized religion almost requires that Del reject it, but at the same time, experience reveals to Del what she requires: the nature of the divine. Owen’s terrible love for Major and the fact that it could not save Major is both the paradox of existence and the revelation she had been seeking. God is in the world and paradoxical: amazing, indifferent, beyond faith.